The Engineering crest was created by Engineers Canada, in partnership with Girl Guides Canada, to be awarded to guides who complete engineering-related activities under the supervision of a member of the engineering community such as a professional engineer, engineer-in-training, engineering graduate, or engineering student. These activities—things like exploring how vehicles work, introducing the concept of simple machines, or experimenting with how lipstick is made—are designed to illustrate the many ways that engineering shapes everyday life. By participating in the program, girls also gain a better understanding of how the world around them works. Either an engineering professional or the Girl Guide leader can initiate the process. While any member of the engineering community can lead the activities, Engineers Canada encourages the participation of women in particular because of the lasting impact that female role models can have on girls choosing to pursue engineering careers. Anyone interested in using the crest can confirm conditions of use and order required quantities through the online order process. To earn the Engineering crest, Girl Guides must complete an activity that helps them understand how engineering plays an integral role in their daily lives. The activity must be led by a member of the engineering community. This can be a professional engineer, an engineer-in-training, engineering graduate, or engineering student. Unit leaders are welcome to collaborate on leading the session with the engineering professional and to use any relevant activities subject to the approval of Engineers Canada. A few sample activities are available for download. Units completing activities to earn the crest must complete a program evaluation survey that will be made available upon placing a crest order. 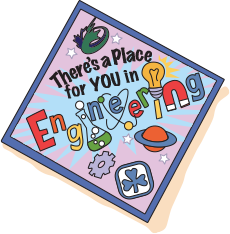 This Engineering crest is designed primarily for the Brownie program but leaders can contact Cassandra.Polyzou@engineerscanada.ca to assess suitability for other age groups. The crest is available at no cost. A shipping fee for all orders over 100 crests will apply.